Dr. Joaquin Navarro on steps leading upstairs to his home. Dr. Joaquin Navarro’s term as Alamos Mayor-El Presidente runs from 2009 to 2012. 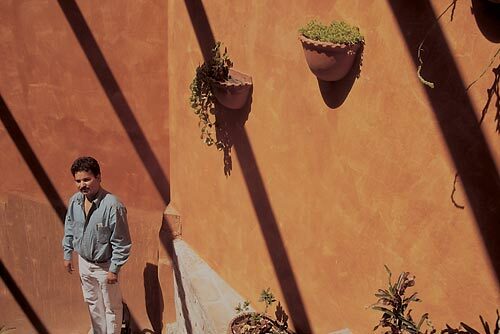 On this day in 1996, men were in the courtyard-driveway of his home preparing trucks for a political campaign tour of the towns and ranches outside Alamos. The rural population, important votes and a political base for Navarro, was more twice that of the city and any elected Mayor oversees a vast geographical region with its governmental hub being the Palacio. He was in the midst of another run as the PAN mayoral candidate after a close, and contested, defeat in 1994. I wonder if he campaigned every election until he won in 2009. Here is a man who didn’t take no for an answer if he felt it was the wrong answer. His government website Municipio de Alamos, Sonora is a good example of his media awareness. His home-compound was striking. There was nothing like it in Alamos. Light was a dramatic centerpiece no matter where you looked. Outdoors, indoors, living space and work space flowed from one area to another. The orange wall, which today may be covered by ivy, was a modern monumental gesture. Emiliano, Joaquin, Joaquinto, Luz and Natalay in their sun-drenched living room. 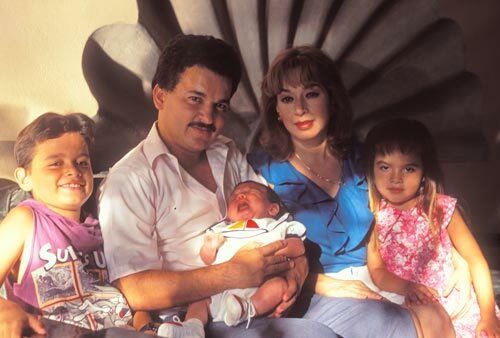 The Navarro family as photographed in late September 1996. Today, Dr. Joaquin Navarro and his wife, Dr. Luz Maria Fernandez, both have General Medicine practices and operate a medivac ambulance service to Tucson. Everyone I spoke with, whether they agreed or disagreed with Joaquin’s political thoughts, had wonderful comments about medical care they received from Dr. Navarro. Joaquin, whose English is excellent, had a friendly demeanor and attentive focus during our conversations, good traits for a doctor, and a politician. When I became ill the first person I contacted was Dr. Navarro’s office. He was’t in and his wife was not available, they were busy in Navajoa giving birth to Joaquinto. 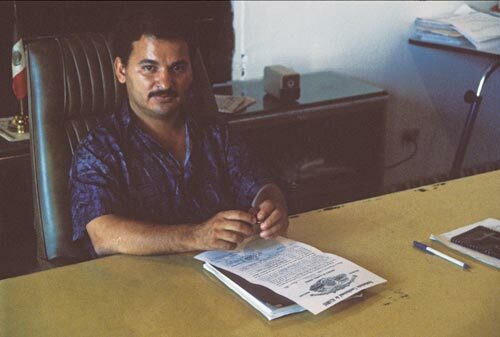 Dr. Navarro at his desk as the opposition's observer in the Palacio. I spent a summer morning in the Palacio documenting the range of government offices on its two floors surrounding a large courtyard. In each small dark space there were a couple of people at work with occasional typewriter chatter and muffled phone rings. I came upon Dr. Joaquin Navarro, alone, neatly attired, sitting in his office behind a clean desk. He spent time here each working day to monitor what the present government was doing. His presence, in a harmonic way, continued a long standing traditional of Alamos political rivalries and discord. Visit Journal entry #06 Friends, and morning sun, converge outside-inside Palacio Municipal to learn more about events that led to Dr. Navarro and this vigil. A modern frame for a classical landscape, Anders painting in progress. 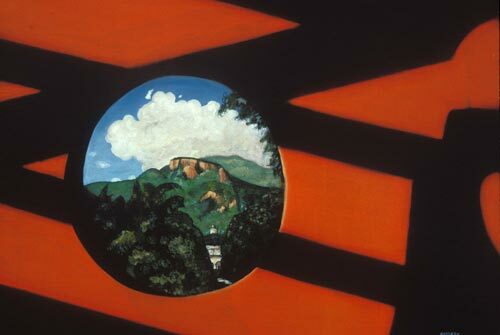 This is a painting, soon to be finished, of the dramatic northern wall of Dr. Navarro’s home. Joaquin indicated he was responsible for the design, it spoke of a modern mind. A time-lapse study of this image, rich shadows racing across the wall as light changed on the scene within the circle, would make a wonderful short film. Today and yesterday are one, together they foretell the future. 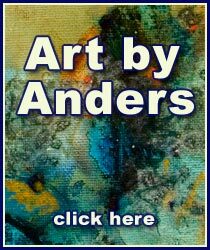 To see more Anders Alamos artwork visit Alamos paintings .